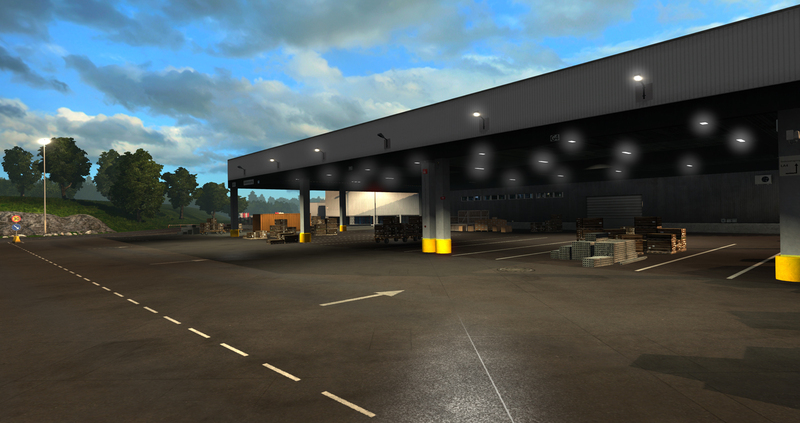 We have a couple of new screenshots from Scandinavia DLC, continuing where our last blog post left off: new special places based on real industry locations. This time around we would like to share a preview of Swedish Volvo Trucks factory in Tuve, Gothenburg. When designing the area we relied on photos kindly provided to us by Volvo Trucks to ensure accuracy and good presentation. 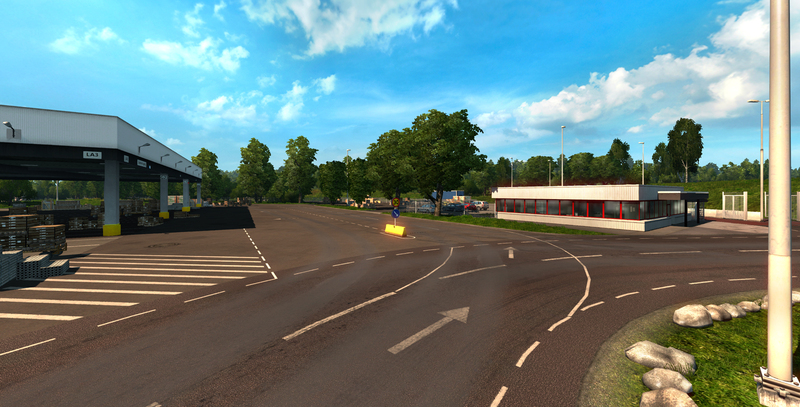 Drivers in Scandinavia DLC will have the unique opportunity of becoming a vital chain of truck industry logistics by delivering new vehicles directly from manufacturing plants to showrooms and dealerships where they are sold! will this be in the next update? No, this is part of the Scandinavia DLC, which is still in development. Can't wait for this update. This looks very awesome! This is the Scandinavia DLC, not the update. Just so you know. Aha! Good to know. Do you know what the price is for it? Awesome!! Nice work scs..!! When will this update come live..?? It's not an update, its the Scandinavia DLC and is still in development. Excelente ¿Para cuándo el Scandinavian DLC? Estoy ansioso por recorrerlo. Great news! Again! So looking forward to this! Wait... so does that mean that we'll be able to transport trucks? SHUT UP AND TAKE MY MONEY! What about Euro Coach simulator? :( I am dreaming of it. Same here, would like to drive some buses. Since ATS is still in the works and there's no conformation that the game is being developer I'd say we will have to wait a really long time for it. Хрен его знает КАК это будет выглядеть на самом деле! "Drivers in Scandinavia DLC will have the unique opportunity of becoming a vital chain of truck industry logistics by delivering new vehicles directly from manufacturing plants to showrooms and dealerships where they are sold!" Why does your screenshots looks nothing like the game ? Stop using photoshop in every screenshot! 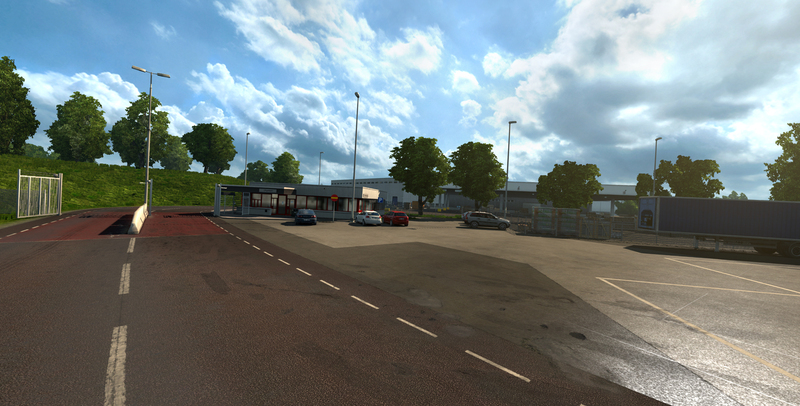 The light and shading settings in the game - the whole day & night cycle and sky rendering - will be replaced by a new system when DLC Scandinavia is released, as hinted in http://blog.scssoft.com/2014/11/euro-truck-simulator-2-114-daf-update.html. Some of our artists are already internally using this new setup while it's still being tweaked. driving it to the showeroom? damn SCS that's a new thing that sounds damn awesome. btw now that you are doing like scania and volvo is there any chanse of seeing man merc daf renault homecompanys entering the maps that already excist? SCS excellent work !!! I liked so much the idea of deploying this look of real industries to companies where the loads are delivered. In my opinion it would be very interesting to implement this idea, at least in the largest and most important cities of the countries present in the game. It would be possible to think about developing it for future updates of the game? Totally cool! How about adding Mercedes-Benz truck factory at Wörth am Rhein near Stuttgart? Please more trailer attach points! Guys these are really amazing news. I really loved the new feautes you guys are making! The ideas are really great! I am sure that this DLC will be awesome. Also, looking forward to chirstmas jobs! I really can't wait to see all these new features! :)) Thanks for always bringing new features to the game! I love you guys! Fix the FPS problem first for god's sake!!! My entire fleet is formed by Volvo trucks! Magnificent job! The delivery of automotive technology deserves special thanks! I wonder how it will be look new automotive platform with trucks!?! Wow. More stuff like this! Will this DLC be free? or...? An Amazing job scs team!!! Is there an ETA on Scandinavia DLC? Hi ! I have a totally off topic question. Why they can't obtain the Mercedes Benz license ? They have! On an older post to talk about the new 2012 Mercedes Actros they are modeling to add to the game in a future update they said that they finally got a license for that brand and can now "complete the Big Seven European truck manufacturers". They didn't say when Majestic will finally become Mercedes, but I'm assuming it's going to happen when they release the new truck. Thank you for information ! Will Norway, Sweden, Denmark and Finland be Available for driving in? If norway is in it make sure to take my hometown with in the DLC(Trondheim). I Want this Scandinavia DLC yesterday !!! WHY! - Are the speed-signs written in Tratex White in Scandinavian-addon, In real Sweden (There I live) We don't have Tratex-White on the Speed-signs just on the "normal signs" or "The way name" <-(t.ex E4)... I want an answer! Very exciting to see the new features!